Although Brooklyn and surfing seem like an unlikely pair, you'll be hard-pressed to not see surfers out catching waves in the Eastern beaches of Brooklyn this summer. 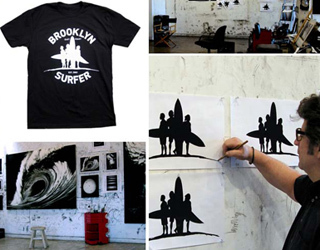 Williamsburg-based surf/skate/snowboarding brand Brooklyn Surfer's been outfitting this small, but very much alive, community for the past seven years, and now they've got visual artist (and former neighbor to recent-Academy award winner Kathryn Bigelow) Robert Longo on board. 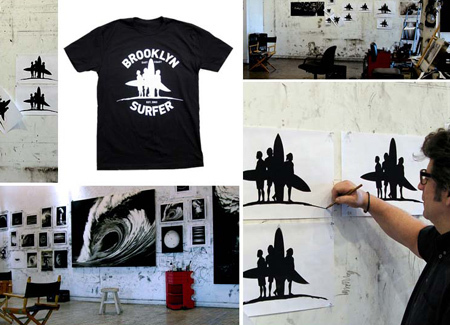 Longo has designed a t-shirt for the company, pictured above, based on a memory of seeing the silhouettes of surfers standing against the sun in the Far Rockaways. The design is very Endless Summer-meets-punk and will be available online and in select stores in May. We eagerly await the day we can wear ours with a pair of cut-offs to the beach.